Inconspicuous basics quickly become the highlight of the outfit. 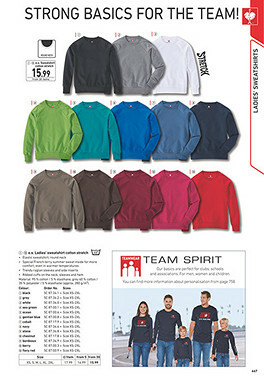 Bright and discreet colours meet an elastic sweatshirt that passes any styling test and any extreme challenges at work. Thanks to its comfort and intelligent visible details, this sweatshirt is a very special basic item that also stands out thanks to its feminine design and high-quality materials. Material: 60 % cotton / 35 % polyester / 5 % elastane (approx. 280 g/m²). Too warm for sweatwear, too cold for jersey - just perfect for French Terry! It's no wonder that this material is also known as "summer sweat material". However, in contrast to conventional sweat material, French Terry stands out thanks to its special inner values: The inside of the material is not roughened, instead it has a unique fine loop design. A very soft material that is extremely comfortable! Slightly tailored cut in standard length.